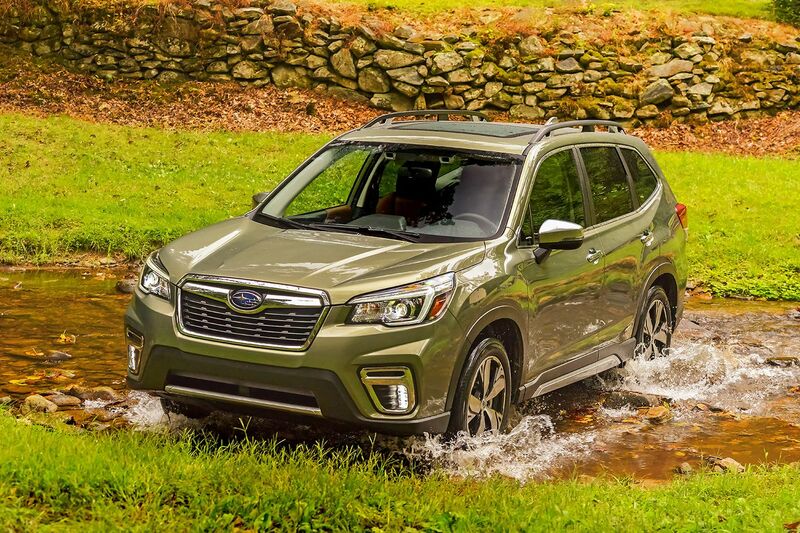 The 2019 Subaru Forester has been redesigned inside and out for its fifth generation. Price: The Sport model starts at $28,795. A base starts at $24,295. Reality: … but not much change is obvious in this Forester. What’s new: I’ve always liked the Forester. It’s a boxy thing that feels as if it’s just the right size, goes where you point it, and sounds like a little bumblebee as it flits between Trader Joe’s and Urban Outfitters. Now, the Forester continues Subaru’s trend toward larger, roomier vehicles. The Forester remains a five-passenger small SUV, though, and the changes are subtle as a … Subaru. The Sport trim is a whole new addition to the model. Buyers might enjoy a black grille and 18-inch wheels, and orange accents inside and out. I didn’t, but buyers might. Up to speed: No one is going to get whiplash from sporty acceleration in the new Forester Sport. It moves well enough, but it feels like the 182 horsepower the 2.5-liter four-cylinder engine provides, and not one horse more. It’s a sizable jump for the 170 in the previous edition, though. Still, hills can be a bit of an issue. Sixty miles per hour comes in a putt-putty 9.6 seconds, according to Motor Trend. Car and Driver got 8.5, but I’m inclined to go with the former. Shiftless: Subaru puts CVTs into all Foresters, so the power curve should, in theory, be seamless. It adds seven “gears” and paddle shifters for those of us who just can’t let go. On the curves: The Forester leans a lot into curves, and stuff resting on the seat moves around a great bunch. Handling is pillow-like at best. Looking out: The old-style tall windows and low belt line make the Forester among the easiest new cars to live with. Visibility is good on all sides. The 2019 Subaru Forester Sport offers mostly cosmetic treatments to the larger SUV, including larger wheels and orange accents inside and out. Driver’s Seat: The basic seats in the model tested offered plenty of comfort. The height of the Forester is just right as well, needing no climb for getting in and out, and offering a comfortable driving position. Friends and stuff: Rear legroom was so plentiful that 6-foot-2 Sturgis Kid 4.0 was happy to sit behind the 5-10 old man. That can be hard to find in many vehicles. Head room and foot room were generous as well. Cargo space is 76.1 cubic feet with the rear seat folded, 35.4 cubic feet behind the second row. Words of warning: Subaru puts lane-departure warning on all its cars now, and there’s no turning it off. Fortunately it was set blissfully quiet in the test model, so know how to adjust the volume if needed. I like to think I’m not weaving all over the road, and that it’s just super sensitive. Play some tunes: The Subaru stereo offered knobs for volume and tuning, and buttons for changing the source. CarPlay is offered and functionality is pretty easy. Sound was about a B+. Keeping warm and cool: The vents in the Forester are about as overdesigned as I’ve seen, leaving air direction control difficult. Chug: The Forester did have one episode of power surge. While driving a fairly warmed-up car in the rain, I noticed a bit of chugging while climbing a short hill. The problem came on the final day and so never presented itself again. Fuel economy: I averaged about 27 miles per gallon in the usual Mr. Driver’s Seat round of testing. How it’s built: Consumer Reports predicts its reliability with be a 4 out of 5; it’s been a 5 for 2018 and 2016, 4 for ’17, a 3 and a 2 before that. In the end: Look elsewhere for a hot rod. But it’s easy to live with the Forester, a nicely sized, roomy, and enjoyable companion.